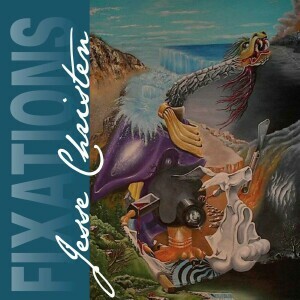 Hot on the heels of last year’s ‘Gate Of Charity’ album, Sioux Falls guitarist Jesse Christen’s sophomore CD release ‘Fixations’ is one to stand up and take notice of. Right out of the gate, “Sprung” reminds me of the string bending guitar histrionics of many of the 70s leading rock gargoyles. As the back cover quote from Christen claims, this disk is indeed a “detour from today’s disposable entertainment and cult of commercial celebrity”. “Steamin’ Mark” starts with a smoky late night blues club feel, before building in to a reverb-drenched Trower-meets-Mick-Taylor type of jam. The ghosts of Cream and Zeppelin make their shadowy presence known from time to time, but the overall vibe of the ‘Fixations’ release is not in any way to be confused with “retro”, as these vibrant compositions breathe in and out with a clean and invigorating contemporary rush. Christen’s wah-wah and tasteful use of effects cut through the fabric on the aptly titled “Splittin’ The Sheets”. It is quite impressive how many different musical personalities come in to play over the course of this CD’s 12 tracks, especially given the fact that this is an all-instrumental effort. Case in point, the nod to country pickers displayed during the acoustic “String Me Along”. The coup de grace might be “Side Hack Dog”, which builds from a smooth slide exercise to a full blown multi-layered guitar hero workout, complete with shimmering backdrop picking, crunchy rhythm breaks, and a mile-high soaring solo that breaks through the sonic sound barrier. Without question, this CD is my favorite new “fixation”.